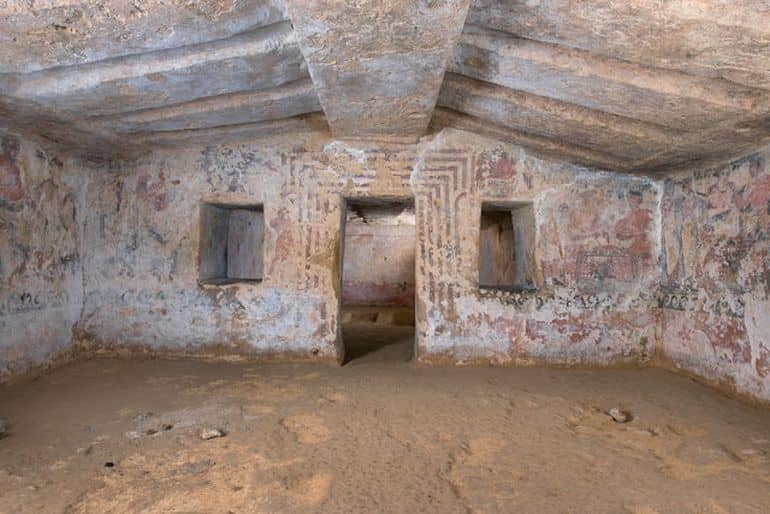 The Etruscan Necropolis of Monterozzi in Tarquinia stands testament to the artistic achievements and capabilities of the ancient Italic people. Within this perimeter, the Tomb of the Shields, dating from circa 4th century BC (corresponding to the Hellenistic period), boasts its UNESCO World Heritage Site status, accorded in 2004. 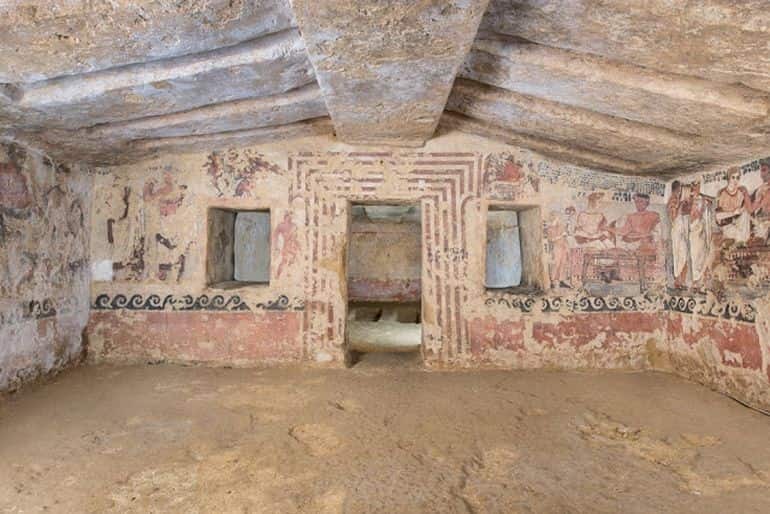 And now, after two years of painstaking restoration processes focused on the central chamber, the 2,400-year old magnificent murals of this Etruscan tomb have once again ‘reclaimed’ their innate luster and vivacity. The fascinating endeavor was partially funded by the Italian Environmental Fund via the campaign “The Places of the Heart”. 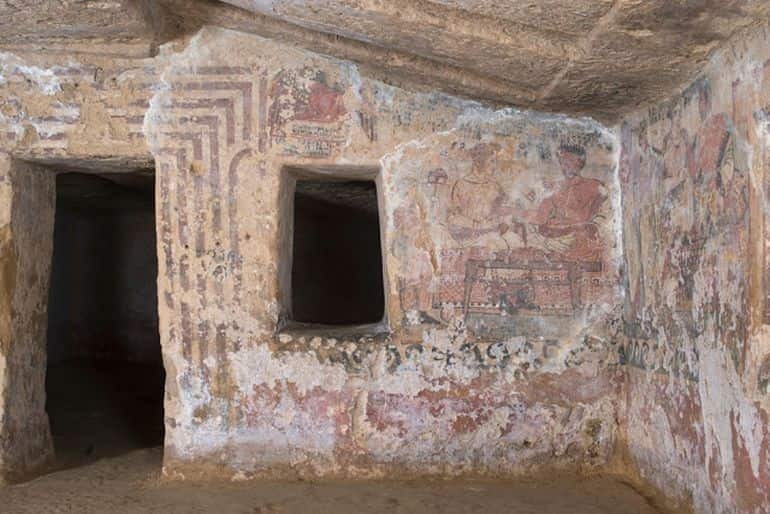 The Tomb of the Shields, (dated 340 BC and discovered in 1870), is a large and complex hypogeum with four doorways, one in the central position and linked to a room at the back, with two others on the sides, linked through doors and windows, all decorated with painted frames. Its name derived by the fact that walls of the room at the rear of the tomb are decorated with numerous golden shields. 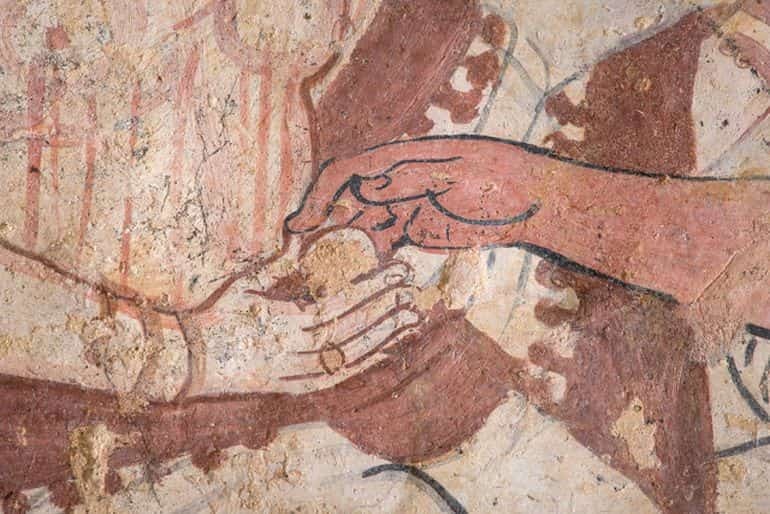 A number of scenes are painted on the entrance wall, showing members of the Velcha family, the tomb occupants. 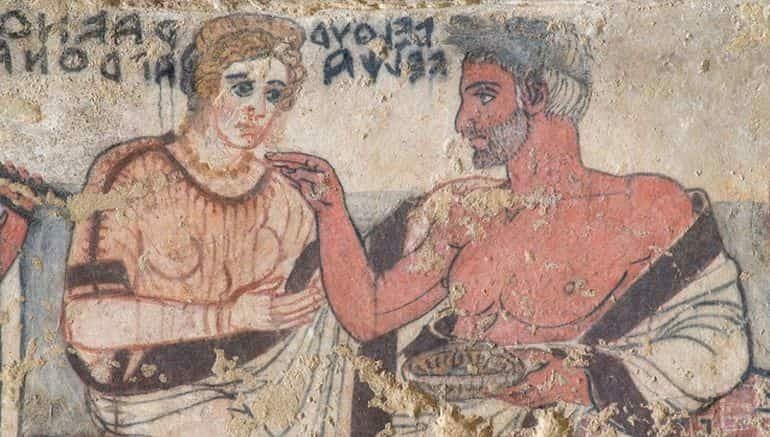 On right of the wall in front of you , there is a banquet, with Larth Velcha reclining on his bed with his wife Velia Seitithi, who is passing him an egg, symbol of rebirth , often reproduced in Etruscan tomb paintings. She is well dressed, and is seated next to her husband’s feet, as was the custom. Not far from them, on the right wall, two other members of the family, Velthur and Arnth, the grandparents of Larth, are standing, dressed in large cloaks. They are accompanied by two young musicians. On the left wall Velthur and Ravnthiu appear again, but this time, they sit on folded stools. Velthur is holding a sceptre, symbol of his power. Over the windows, winged Spirits appear. 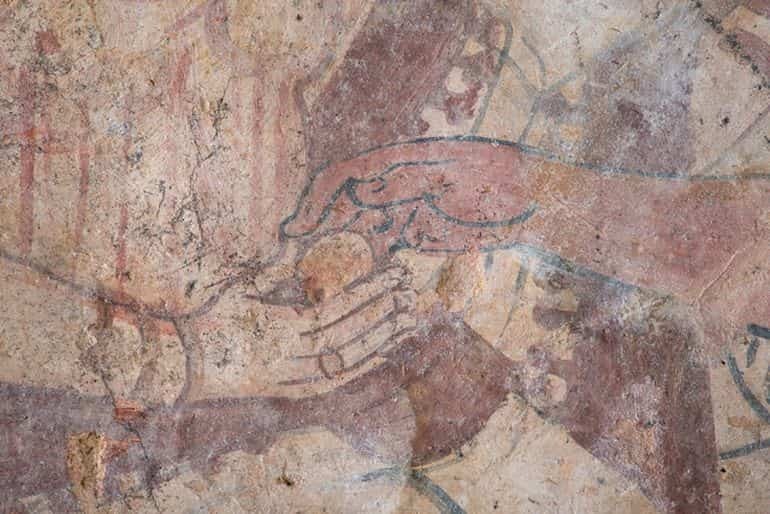 Essentially, the murals, with their intrinsic expressiveness, sought to represent the civic virtues and high status enjoyed by the Velcha family. These splendid visual cues combined the poignancy of the moment when the deceased left for the afterlife and the fellowship of the family members in the consequent funeral banquet. 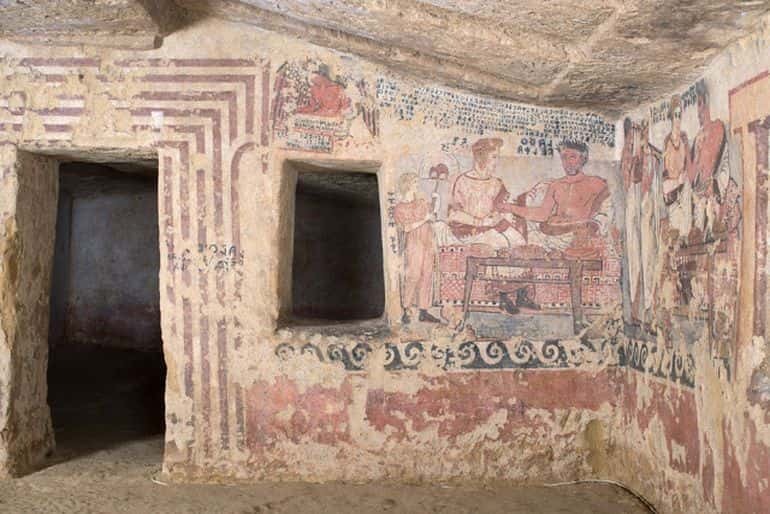 Furthermore, beyond just the paintings, the Tomb of the Shields is notable for its inscriptions written in Etruscan that refer to the names, surnames, and cursus honorum (‘order of public offices’) of the related people. 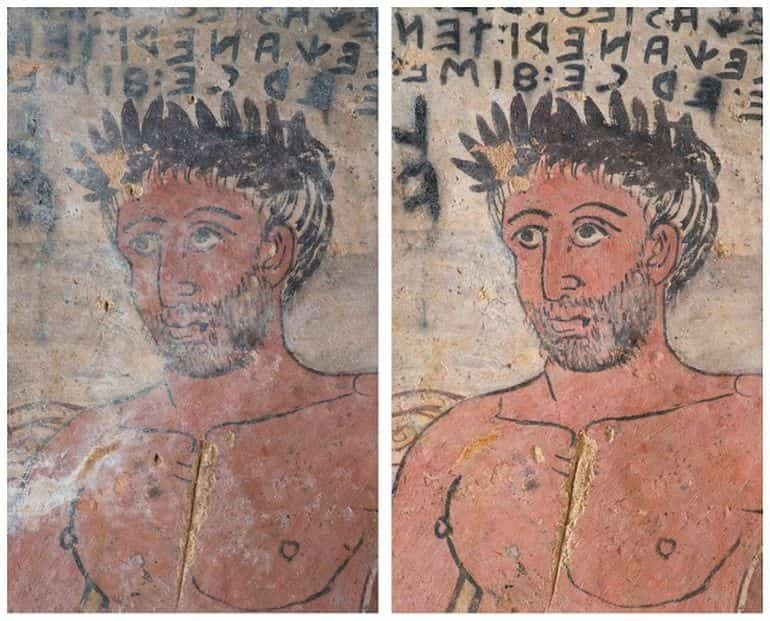 However, like many comparable ancient wall paintings, the rich hues of the Tomb of the Shields were beginning to deteriorate in terms of their visual impact, probably due to the effect of temperature fluctuations within the enclosed space. The predicament was further exacerbated by overshadowing coats of a white patina of calcium carbonate (caused by bacteria and humidity) and various patches of black spots brought on by fungus. Thus a restoration project was unveiled in 2016 under the supervision of the region’s Superintendence. 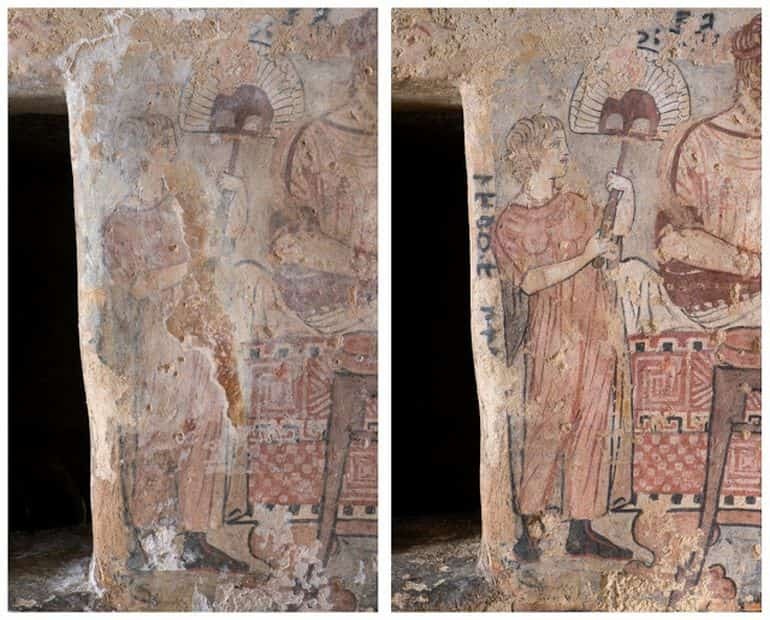 And intriguingly enough, the endeavor not only allowed for the preservation of the extant frescoes but also revealed sections of previously undiscovered figures, inscriptions, and details. Moreover, while the researchers have completed their restorative works inside the central chamber, they are looking forth to shift their focus on the rear chamber (adorned with shields – which gives the tomb its name) and two adjacent rooms.